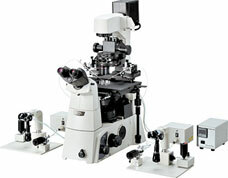 Nikon and Narishige developed this high precision,compact micromanipulator system in response to increasing demand from the IVF/ICSI market. The NT-88-V3 series allows you to configure the optimum combination to suit your specific micromanipulation needs. Manufacturer: Narishige Co., Ltd. (manipulator), Tokai Hit Co., Ltd.